LG has shown off a 5-inch mobile screen that makes the iPhone 4S's retina display look like an 8-bit NES graphic in comparison. The screen is 1080p HD resolution -- the same as HD TV screens -- meaning it has a pixel density of 440ppi. Compare that with the iPhone's 326ppi, and the fact that Apple's is just 3.5-inches to LG's 5-inches. It has a 16:9 aspect ratio, so it'll be ideal for watching HD movies on. There's also Advanced High Performance In-Plane Switching (AH-IPS), which is tech that makes sure you get the widest viewing angles possible, quickened response times, and improved brightness efficiency. It's so high resolution, the naked eye shouldn't be able to distinguish between individual pixels. And this is no mobile pie in the sky. The screen should be available in products in the second half of this year. Could we see a Galaxy Note-smashing 5-inch mobile coming from LG soon? The screen is 0.5-inches larger, with 2.2 times the pixel density than its previous 4.5-inch screen. That one had 329ppi. Pah. How quickly it looks out of date. It's not actually the highest resolution mobile screen to date. Toshiba showed off a 6.1-inch tablet screen with a 498ppi resolution last October. Though we're yet to hear any more from Toshiba on the matter. 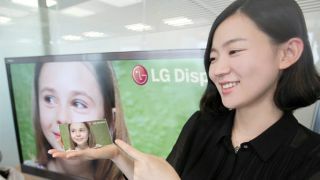 LG's screen will be on display for the first time at SID 2012 Display Week in Boston starting a week today.